Love cherry trees but have very little gardening space? No problem, try planting cherry trees in pots. 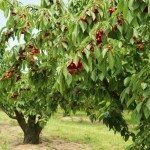 Potted cherry trees do very well provided you have a container that is large enough for them, a pollinating cherry buddy if your variety isn’t self-pollinating and have selected a variety that is most suited to your region. 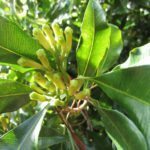 The following article contains information on how to grow cherry trees in containers and how to care for container grown cherry trees. Also, if you don’t have room for two trees, look into a tree that has cultivars grafted to it. You may also want to look into a dwarf variety of cherry if space is at a premium. Container grown cherry trees need a pot that is deeper and wider than the root ball of the tree so the cherry has some room to grow. A 15-gallon pot is large enough for a 5-foot tree, for example. Be sure that the container has drainage holes or drill some in yourself. If the holes seem large, cover them with some mesh screening or landscape fabric and some rocks or other drainage material. At this juncture, prior to planting, it might be a good idea to set the pot on a wheeled dolly. The pot is going to get awfully heavy when you add the tree, soil and water. A wheeled dolly will make moving the tree around much easier. Look at the cherry tree’s roots. If they are root bound, prune out some of the larger roots and loosen the root ball up. Partially fill the container with either a commercial potting soil or your own mix of 1 part sand, 1 part peat, and 1 part perlite. Place the tree atop the soil media and fill in around it with additional soil up to 1-4 inches below the rim of the container. Tamp the soil down around the tree and water in. Once you are done planting your cherry trees in pots, mulch the top soil to retain moisture; container grown plants dry out more quickly than those in the garden. Once the tree has fruited, water it regularly. Give the tree a good deep soaking a few times a week depending upon weather conditions to encourage the roots to grow deep into the pot and prevent fruit cracking. When fertilizing your cherry tree, use an organic seaweed fertilizer or other all-purpose organic food on your container grown cherry. Avoid fertilizers that are heavy on the nitrogen, as this will give it gorgeous, healthy foliage with little to no fruit.